Seeko’o Hotel by Atelier King Kong Architects; photo by Arthur Pequin. ELLE DÉCOR’s Dining by Design is an annual fundraising event organised by DIFFA (Design Industries Foundation Fighting AIDS) that brings top architects and designers together to create and display unique and experiential dining venues. Each design team is given an 11' by 11' space, a table, and 10 chairs to design. Christian Arkay-Leliever, Director of Strategic Innovation at Skidmore, Owings & Merrill (SOM), wanted to create something more intriguing, a virtually seamless solid piece that would serve as both table and chairs. The table design called for modular seat and table surface sections that would be arranged to seat a dinner for 10. When completed, Arkay-Leliever’s eight-foot tall dining environment would be composed of over 700 square feet of surfacing material, including the table, walls, floor and seating. The team needed to select a durable material that could be constructed without visible seams, and be lightweight and inviting, as the designer envisioned. The surfacing material required specific colour and aesthetic options from which the designer could convey his modern, monolithic and monochromatic vision. “Corian® was a wonderful material for the project because it allows for many different aesthetics to be created through various fabrication processes. We tried to showcase the many different faces of Corian®, through milling, cutting, thermo-forming, joining and polishing,” said Arkay-Leliever. With no grout or seam gaps to trap soil, Corian® solid surface is easy to clean and has an immaculate appearance. Offering elegant and dramatic material flexibility outside traditional horizontal surfaces, Corian® can be carved, sandblasted, etched, thermo-formed and moulded, turning exhilarating visions for design and architecture into reality. 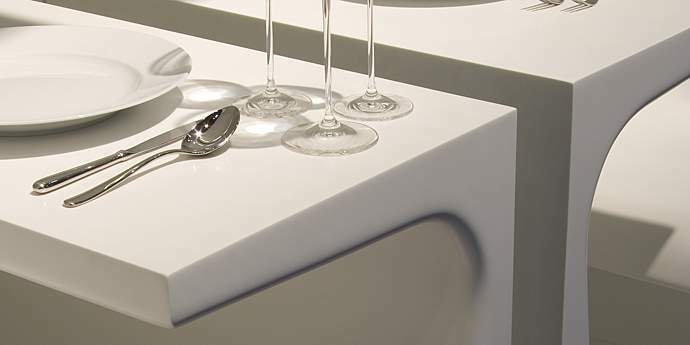 “Corian® is ‘cool’ to the touch and has a most wonderful tactile quality. From an architectural and design standpoint, Corian® is not just a horizontal plane option, it has innate characteristics that are unmatched,” said Arkay-Leliever. Baku, Azerbaijan: the new, world-class Bona Dea international hospital, delivers functionality and aesthetic quality, inside and outside, with Corian® Solid Surface.